Note that the many people with influenza in the community do not get tested for influenza, and that there may be delays in the reporting of confirmed influenza cases. 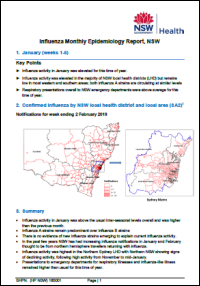 Therefore data presented here may tend to under-represent current influenza activity in NSW. Please also note that due to the complexity of these reports they are only presented in the PDF format. Reports can be provided in other formats if required for accessibility. Submit an alternative format request.